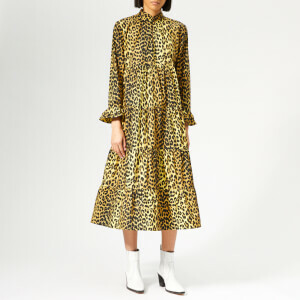 Leopard-print wrap skirt from Copenhagen-based fashion label, Ganni. Crafted from a floaty, semi-sheer, mesh-like fabric, the ‘Tilden’ maxi skirt fastens with a self-tie waist belt and features an asymmetric hem embellished with a ruffle trim. Lined.